Last night Belmont University’s Massey Graduate School of Business Alumni Board recognized two outstanding alumni—Studio Bank Executive Vice President and Chief Relationship Officer Harry Allen and Soukup, Bush & Associates’ Shareholder Dan Soukup—who have demonstrated excellence in the areas of professional achievement, community involvement, and commitment to the Massey School. Harry L. Allen graduated from Belmont with a Bachelor of Business Administration in international management in 2004, after being admitted as a Hearst Scholarship recipient and to the highly competitive Honors Program. He also earned his Master of Business Administration from Belmont’s Massey Graduate School of Business in 2010 as an H.B. & Dorris Massey Scholar. 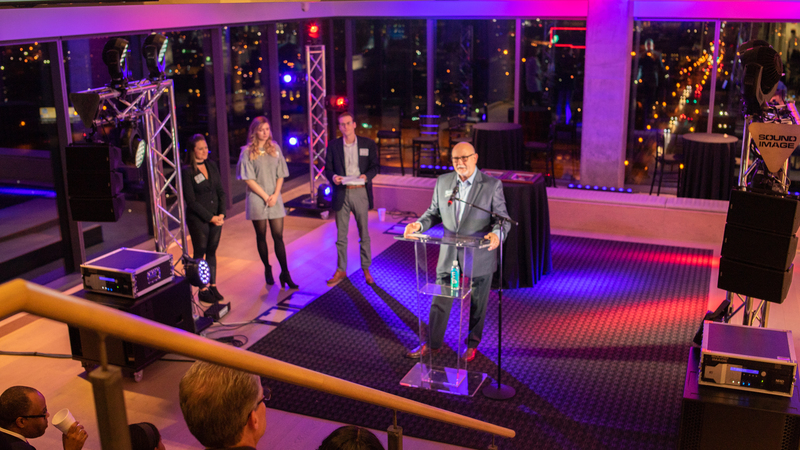 He is a co-founder, executive vice president and chief relationship officer of Studio Bank, Nashville’s newest locally-headquartered boutique bank. He serves as the Bank’s lead business development officer and manages the Bank’s involvement and investment in community efforts. He also serves as the key manager of relationships with stakeholders such as the Bank’s Founders’ Advisory Board, civic and economic development organizations and other strategic partnerships with external stakeholders. Key among Allen’s responsibilities is his role in directing and implementing the Bank’s strategy for engaging not-for-profit and education clients, a target market segment for the Bank. A native of Nashville, Allen is active in the Nashville Community serving on the board of directors for the Center for Nonprofit Management (Treasurer), Leadership Middle Tennessee, and is a Trustee of Belmont University (Finance & Endowment Committees). He is a 2008 winner of the Chamber’s Nashville Emerging Leader award, a 2011 honoree of Nashville’s Top 30 Under 30, a 2014 honoree of Nashville Business Journal’s Top 40 Under 40, a 2018 Inductee into the Public Schools Hall of Fame by the Nashville Public Education Foundation, and a 2018 honoree in Nashville Business Journal’s Power Leaders in Finance. He is also an active member of the Rotary Club of Nashville where he has previously served as Treasurer and was recently elected President-Elect. Dan Soukup graduated with honors from Belmont University in 2004 with a Bachelor of Business Administration with an emphasis in accounting. While at Belmont, he played on the baseball team from 2001-2004 and was named to the NCAA Division I Baseball Academic All American Team in 2004. He received his Master in Accounting in 2005, also from Belmont University while achieving a 3.9 G.P.A. in the graduate program. Soukup is a shareholder with Soukup, Bush & Associates, P.C. in Fort Collins, Colorado He is an attest partner in charge of financial statement and 401(k) audits, internal control and financial statement reviews and compilations. He also provides tax planning, compliance and accounting services for individuals and privately held businesses. Prior to joining the firm, Dan had five years’ experience at multinational accounting firm Deloitte & Touche LLP, where he was primarily involved in audits and reviews of various privately held entities whose revenues ranged from $50 million to $13 billion. He received his Certified Public Accountant license in 2007. Dan sits on the Board of the Colorado Society of Certified Public Accountants (COCPA) and is a member of the American Institute of Certified Public Accountants. The Massey Distinguished Graduates Award Ceremony was held on Tuesday night at the WME offices in Nashville.